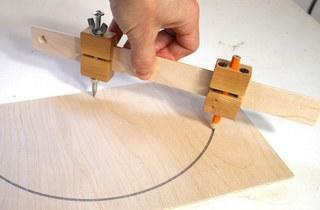 For lightly curving arcs, it's easiest to just force a thin strip of wood into an arc. In this photo I have a thin strip bent to roughly a circular arc. A small spacer and a C-clamp on either end apply bending moment to the ends of the strip. With the bending moment applied at the very ends, the bending moment is the same along the length of the strip, resulting in an even rate of curvature along the length. The resulting arc is very close to circular. It would be easier to just put a big spacer in the middle instead of two small ones near the clamp, but if you do that then the ends of the arc end up with less curvature than the middle, so the arc is much less of an approximation of a circle. An advantage of this technique is that you can just hold the arc shape up to your work piece and make sure that it lines up with everything, and only then trace it out with a pencil. Drive a nail at each end of the desired arc. Then attach two straight strips of wood to each other at an angle. Trace your arc with a pencil positioned at the intersection of the strips, sliding the strips and the pencil along both nails. To set the angle of the two pieces of wood, hold the pencil at the desired midpoint of the arc and attach the strips of wood to each other so that they both touch the pencil and the nails. A neat property of this method is that the angle covered by the arc is exactly equal to twice the change in angle between the two strips of wood. To make an arc that covers 90 degrees for example the angle between the strips should be 135 degrees (180 - 90/2). For very shallow arcs, I prefer the first method though.